When you spend as much time as I do going over the various announcements Microsoft makes via blog posts or at Ignite sessions, you inevitably start developing a sense for detecting not only the loads of marketing crap, but also those hidden details both marketing and engineering folks suspiciously skip out. 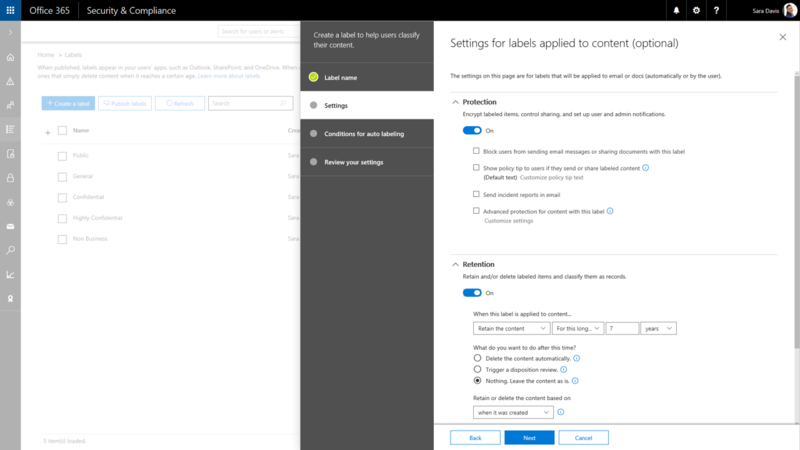 One such example is the story of “Unified labels” in the Office 365 Security and Compliance Center. We first heard about Microsoft’s intention of bringing together the AIP and SCC labels back at last year’s Ignite conference. The story was great, provide a unified classification, labeling and protection experience across all workloads and clients. And then we started waiting. Almost nothing happened over the course of the year, and once we got back to Orlando, eager to see what Microsoft did with this feature, a certain fishy odor started spreading. 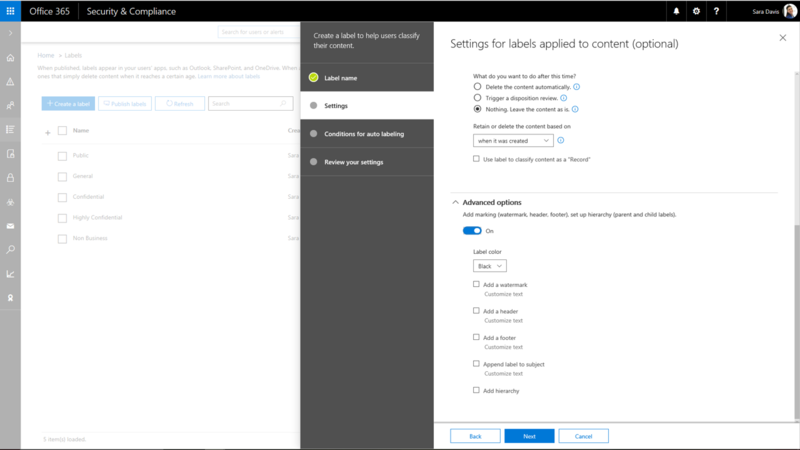 So, forget about having single “unified label” that can be used to classify an item, add visual elements to it, set retention period and action, protect it via RMS encryption, trigger DLP controls whenever it’s shared, and so on. You will still be able do all of these, and more, but simply not via the same “apply a single label” concept. Instead, we will have separate “Retention” and “Sensitivity” labels, and the focus seems to now have shifted to an “unified platform” powering those. Which can again be considered misleading, given the split between Security, and Compliance, which will both get their own portals soon. 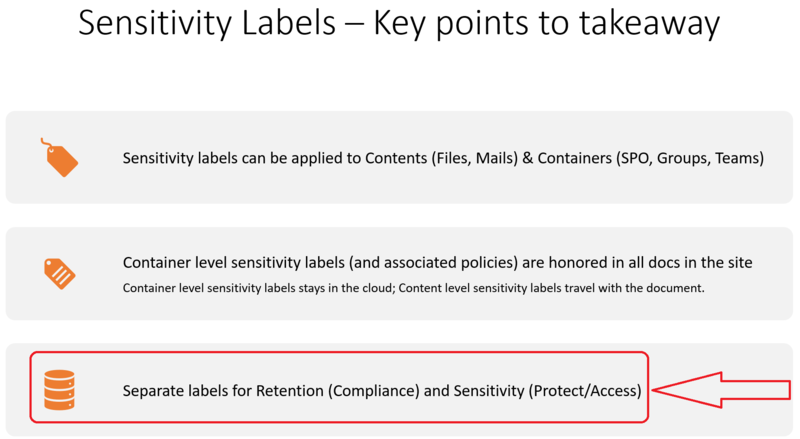 Be aware that when Azure Information Protection encryption is applied to files stored in Office 365, the service cannot process the contents of these files. Co-authoring, eDiscovery, search, Delve, and other collaborative features do not work. DLP policies can only work with the metadata (including Office 365 labels) but not the contents of these files (such as credit card numbers within files). Don’t get me wrong, I love many of the features they showcased and there’s certainly a momentum building in the right direction. However, it has taken them a long, long time and we are still far away from getting true integration between the services and a unified experience. Hopefully, they will prove me wrong and by this time next year I will have nothing but praise to post. I’d love to see this whole concept get some more love from Microsoft. I understand making this type of encryption simultaneously coherent, secure, easy to manage, and accessible to end-users must be incredibly challenging, but until these significant bumps are smoothed out, it’s a hard sell, even to a pro-Microsoft shop. For example, how can an organization enthusiastically adopt AIP and also Teams, the former breaks the later? It’s not like these are both old technologies that have to be retrofitted to work together. Why was Teams even launched without a plan for viewing protected content? Also, how is it possible SharePoint hasn’t been fully onboard with AIP until “soon”? Regular access control lists are woefully insufficient; we NEED AIP for most content, but scanning and labeling/protecting documents across an department, let alone an enterprise is a huge task, and knowing that Microsoft is still changing their minds about how it’s all going to come together almost makes any large scale adoption a dangerous idea.